Since we're officially into Shocktober now, the grand month of Horror Fest(s), I thought I'd kick things off with one of Cap'n Howdy's rare book reviews. 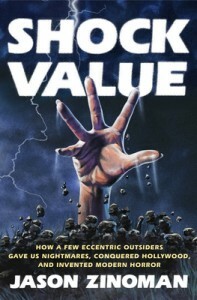 Today I'm looking at Shock Value: How a Few Eccentric Outsiders Gave Us Nightmares, Conquered Hollywood, and and Invented Modern Horror by Jason Zinoman. It explores the period between Rosemary's Baby and Halloween, when outsiders made a huge impact on the way audiences experienced horror films, revitalizing the genre and ushering in a new era we're still feeling the effects of today. When Shock Value appeared on my radar, the only concern I had was that this might be old hat for the Cap'n. I'm a big fan of that particular era of horror, and have been soaking up books, interviews, and DVD extras about The Texas Chainsaw Massacre, The Last House on the Left, Halloween, Alien, and Night of the Living Dead for years. I'm always interested in more analysis, but I had trepidations that Shock Value might bear no new fruit for a horror fanatic. Fortunately, I was well off base. Almost immediately Zinoman surprised me with a story in the Rosemary's Baby chapter, about a Vincent Price appearance on the Mike Douglas show where the horror icon was unable to defend the genre that made him famous (or, perhaps, was not interested in defending horror) from attacks by Dr. Fredric Wertham, the same man who killed EC Comics in the 1950s. I must admit that I had never heard of the debate, or of its impact in the transition from Old Horror to New Horror. Zinoman's coverage of the development of Rosemary's Baby also provides a nice counterpoint to the what Robert Evans presents in The Kid Stays in the Picture, his memoirs of developing pictures for Paramount. Shock Value is filled with surprising moments, including the aborted collaboration between John Carpenter and Tobe Hooper that eventually morphed into Halloween. I was particularly fond of the reactions the major figures in New Horror had to each others' work: for years, I suppose I considered Brian De Palma and Alfred Hitchcock to be mutually exclusive - that one simply mimicked the other, so it was (rightly or wrongly on my part) revelatory to hear that the Master had seen De Palma films before he passed (and didn't like them, to wit). Dan O'Bannon's fall out with John Carpenter after Dark Star produces a great deal of animosity on the former's part, especially to the success of Halloween. Sean Cunningham's reaction to Carpenter's slasher film is classic, and the way that Rosemary's Baby formed what The Exorcist became to William Peter Blatty and William Friedkin (along with the extended explanation of how the "Version You've Never Seen" came to be) were all stories I thought I knew well, but Zinoman finds a way to bring a fresh perspective. The audience is already aware that the (to that point unseen killer) is carrying a knife, and we know what to expect when Michael arrives and his sister recognizes him. The shock of the murder is on her part, not the audiences. Zinoman's point is well made, but it's a sloppy mistake in a critique of "sloppy" moments in Halloween. My only other issue with Shock Value is that Zinoman echoes the central thesis of Peter Biskind's Easy Riders, Raging Bulls at the end of the book. He arrives at the conclusion that the seminal voices of New Horror peaked in their early years, and have struggled to match, let alone surpass, their original masterpieces. Like Biskind, Zinoman highlights the struggles of many of the creative forces to move forward with any success (highlighting the failure of Romero's projects between Night of the Living Dead and Dawn of the Dead, or O'Bannon's reputation as an intrusive curmudgeon kept him unable to parlay his involvement with Alien to anything until Return of the Living Dead. The controversy surrounding Tobe Hooper and Poltergeist isn't glossed over, either). Wes Craven is given the Scorsese-like pass of the "exception to the rule" because of the Scream series re-invigoration of horror in the late nineties (although A Nightmare on Elm Street is given a lukewarm reaction for its innovative first film and watered down sequels).. I take umbrage with this in part because I disagree with the premise of Easy Riders, Raging Bulls, and Zinoman mostly chooses to ignore the fact that John Carpenter had varying degrees of success in and out of horror through Vampires, not limited to The Fog, Christine, or In the Mouth of Madness. He scarcely "topped out" after Halloween and The Thing with an immediate (or even steady) decline attributed to Hooper and Cunningham and Romero. It makes me wonder whether the curious exclusion of Sam Raimi (save for a brief mention of The Evil Dead director during the "end of Horror's New Wave" portion of the epilogue), and the cursory inclusion of David Lynch and David Cronenberg during O'Bannon's "body horror" chapter. Overall, Shock Value has more than enough going for it that I'm willing to overlook minor quibbles like the Halloween analysis or the ambivalent closing. I was initially concerned that the book might be a retread of stories I'd heard in other documentaries (or from the directors / writers / producers themselves in other books), but you'll be pleasantly surprised by the more obscure anecdotes and the depth of insight into some of the heavily covered entries. Horror aficionados shouldn't hesitate to pick up Shock Value, even if you're positive you know what you'll find inside.